Killer Characters: Board Games! Divas! Conspiracy Theories! and Costumes! Board Games! Divas! Conspiracy Theories! and Costumes! Margo Tamblyn is going to drive herself crazy. She's my best friend--has been since elementary school--but ever since she moved back to Proper City and took over Disguise DeLimit (her dad's costume shop), she's been getting more and more stressed out. I know she wants the store to succeed, and I know she wants to prove to her dad that she can do it and he doesn't have to worry about the store while he travels, but it's more than that. I recognize the signs, and trust me, I know what they look like. There was a time when I was like that, back in high school. I was at the top of our class and was named Proper City's Top Young Entrepreneur and I had companies recruiting me before I even graduated. But I didn't handle the stress of trying to do everything all that well and I ended up in a rehab center. So what if the Fortune 500 companies have recycled my resume? I'm a whole lot happier now that I do yoga every morning and spend my days making teddy bears to sell at fundraisers for Money Changes Everything!, my non-profit company. I tried to tell Margo to let something go, but she can't see things as clearly as I do. She's got the store, and since Ebony Wells is coordinating the Sagebrush Festival this year (the theme is Family Game Night), Margo has the added pressure of supplying board game-themed costumes for the festival employees. And the Domino Divas--the headlining act--are making her crazy with their own costumes. Does anybody really expect them to do the routine they first performed in 1968? Between you and me, I'd be surprised if one of them doesn't throw out a hip. And then there's Tak Hoshiyama. I really thought he and Margo were on the same page after Halloween. But he's been on interviews around the country for the past few months, and that's a pretty big message to send to your potential girlfriend who happens to have just taken over ownership and management of the family costume shop. Margo's not moving anywhere. Which means Tak's become one more thing for Margo to stress over. Maybe things would have been better if they'd kept their relationship a secret? Nope, secrets aren't good for stress either. Look what happened there! I'm going to make it my job to watch out for Margo while she watches out for everybody else. We're about to spend the next week working side by side at the Sagebrush Festival. I gave her a table at my Money Changes Everything! booth at the festival so if anything goes wrong, I'll be right there to help her. I know, I'm just being silly. What could possibly go wrong at a board game-themed festival? Board Games! Divas! Conspiracy Theories! and Costumes! 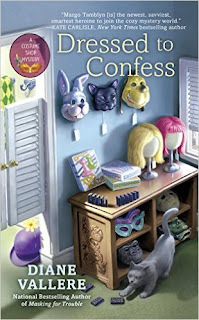 Find out what happens in DRESSED TO CONFESS, Costume Shop Mystery #3, out August 1. 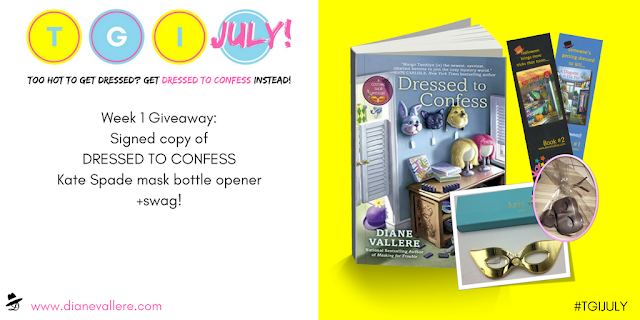 Enter to win a DRESSED TO CONFESS Prize Pack in Diane Vallere's TGI July contest. One winner each week in July! Enter here: http://www.rafflecopter.com/rafl/display/b21909126/? Cannot wait to read this one. Will have to come back to enter. Thanks for the chance! Love the cover -thanks for the chance to win a signed copy. This book sounds really good!! Thanks for sharing the excerpt. This sounds like a great book! Love the cover, too. Ooohhh, love this series and love board games! i read the first book in this series. Margo Tamblyn is a great character with lots of potential. I look forward to reading this next book in the series. Ooh I want to read this one.